«Halogenated and organophosphorus flame retardants in cetaceans of the southwestern Indian Ocean» Chemosphere, 2019. «Occurrence of halogenated flame retardants in sediments and sea urchins (Paracentrotus lividus) from a North African Mediterranean coastal lagoon (Bizerte, Tunisia)» Science of the Total Environment, 2018. «Preliminary study of long-range transport of halogenated flame retardants using Antarctic marine mammals» Science of the Total Environment, 2018. «Assessing the effects of seawater temperature and pH on the bioaccumulation of emerging chemical contaminants in marine bivalves» Environmental Research, 2018. «Halogenated and organophosphorus flame retardants in European aquaculture samples» Science of the Total Environment, 2018. «Catalan names of the new chemical elements» Revista de la Societat Catalana de Química, 2017. «Effect of pyrethroid treatment against sea lice in salmon farming regarding consumers’ health» Food and Chemical Toxicology, 2017. «Insecticide pyrethroids in liver of striped dolphin from the Mediterranean Sea» Environmental Pollution, 2017. «Ocurrence of halogenated flame retardants in commercial seafood species available in European markets» Food and Chemical Toxicology, 2017. «Preliminary assessment on the bioaccessibility of contaminants of emerging concern in raw and cooked seafood» Food and Chemical Toxicology, 2017. «Nomenclatura de química analítica» La terminologia en les ciències de la vida, en la química i en el món educatiu, 2013. 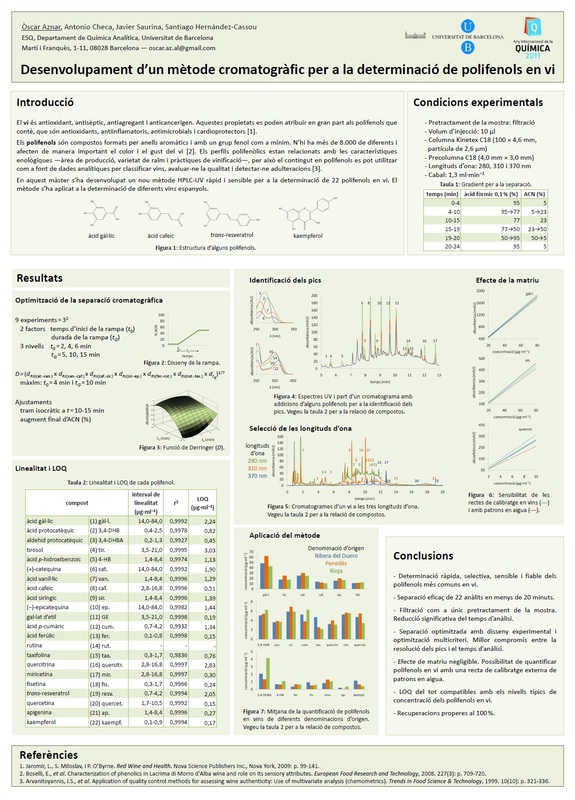 «Determination of polyphenols in wines by liquid chromatography with UV spectrophotometric detection» Journal of Separation Science, 2011. Musical (10 min) reimagining Disney songs, based on the work of the article «Effect of pyrethroid treatment against sea lice in salmon farming regarding consumers’ health» Food and Chemical Toxicology, 2017. Drag queen musical (10 min) reimagining Cell Block Tango from Chicago, based on the work of the article «Ocurrence of halogenated flame retardants in commercial seafood species available in European markets» Food and Chemical Toxicology, 2017. Stand-up comedy (15 min) summarising my whole PhD. YouTube channel about science by a drag queen.